MOSCOW, April 14. /TASS/. Russian voyager and survivalist Fyodor Konyukhov, who is now on a solo round-the-world rowboat voyage, has confessed that it took him all his physical and spiritual strength to survive, with unvaried food with no salt being the worst thing about that, son Oskar, the organizer of the journey, told TASS on Sunday citing his father’s diary. "This voyage has required all my life and spiritual experience. All my survival skills I have developed over 40 years of journeys. I wouldn’t be able to cover even a half of it in my younger years," Fyodor Konyukhov, 67, writes. His boat has survived several storms in the Pacific, including hurricane-strong ones when it tipped over several times. "It’s not the physical strength that matters during this voyage. Can a man, whatever physically strong, confront the ocean? You can survive only through blending into the ocean, into the stream of the energy of waves and winds," he says. The worst of trials, along with the lack of fresh air and the impossibility to straighten himself up, in his words, is unvaried food. "Of course, it is difficult to live on sublimated food for 129 days. I add some cod liver oil, a spoonful of say-bean sauce or tabasco chili sauce now and then. I want something different. When you are amid the ocean you want something sour, salty or acrid. Anything but flat," he writes. Notably, he weighed 79 kilograms when he began his voyage and now he doesn’t even dare to guess how much weight he has lost by now. He is yet to cover 1,450 kilometers to reach Cape Horn separating South America and Antarctica. 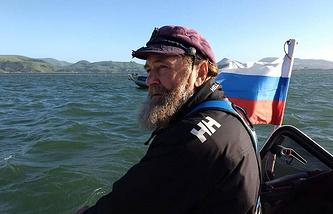 The Russian adventurer began his solo circumnavigation on board the Akros rowboat on December 6, leaving the New Zealand port of Dunedin. The circumnavigator’s route is divided into three stages: Dunedin (New Zealand) - Cape Horn (Chile), Cape Horn (Chile) - Cape Leeuwin (Austalia), and Cape Leeuwin (Austalia) - Dunedin. Konyukhov will have to row 27,000 kilometers in total. Konyukhov has already performed five round-the-world journeys, crossed the Atlantic 17 times and became the first Russian to ascend the seven highest peaks in the six parts of the world and reach the South and North Poles. In 2007, Konyukhov already went around the Southern Hemisphere onboard the sailing boat Alye Parusa (Crimson Sails) through the Atlantic, Indian and Pacific Oceans.